Following the proper safety procedures for picking up students from school ensures that whether students walk, ride bikes, take the bus, or carpool, they are safe and any traffic risks are minimized. Parents should take different safety precautions when picking up students based on when and how they are picking them up from school. If a student will be leaving school early, the parent will need to sign them out at the school's main office. This ensures that the individual picking up the student has the proper authorization to do so and helps prevent strangers from checking out children. Most public and private schools will have authorizations forms on file in the office, and parents should regularly update these forms to ensure that everyone who may need to pick up the child - a daycare provider, neighbor, or other relative, for example - will be allowed to do so. Most parents pick up students by driving or carpooling, and these safety tips can help make navigating the often crowded, confusing school parking lots easier and safer. Avoid driving in the bus lane or bus zone. Stay in designated pick up areas as directed by school personnel. Do not arrange to pick students up on side streets, staff parking lots, or other areas that may not be as safe. Yield to pedestrians, crossing guards, and buses, and be aware that children who are walking home may not look both ways before venturing across a parking lot or pick up lane. Be sure to drive the proper direction through parking lots and nearby streets - some schools may convert streets to one-way traffic when students are leaving. Obey all local speed limits in school zones. This is often no more than 15 to 20 miles per hour on nearby roads and 5 miles per hour in parking lots and pick up zones. Use turn signals when entering and leaving the pick up areas and check blind spots carefully. Do not dally once students have been picked up - other parents are eager to pick up their children and moving quickly and efficiently can help keep the traffic flow more consistent. Parents who pick up their children to walk home should also follow established safety procedures to ensure that no accidents occur. Designate a meeting place near the school's entrance but away from traffic areas. 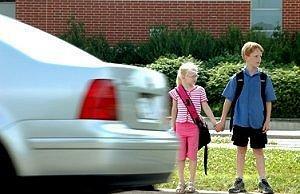 Hold young students' hands while crossing streets or while near pick up areas with moving traffic. Follow responsible pedestrian behavior, including using crosswalks, obeying crossing guards' instructions, and checking carefully before crossing streets. All parents, whether they are walking or driving, can participate in several types of safety procedures for picking students up from school to ensure that everyone can leave school safely and easily. Volunteer to help teachers and administrators direct traffic during peak pick up periods, or volunteer for crossing guard duties. Most schools have established safety procedures for picking up students from school that parents can request. Informational packets may include maps of the parking lot and designated pick up areas - which may vary based on grade level or dismissal time - as well as safety tips, emergency procedures, and other helpful hints. Ask in the school's main office for this information, or contact the school's PTA for detailed guidelines. The school district may also have specialized policies. Every school has slightly different procedures and parents should be sure to update their files each year to ensure the best possible safety for their students.